I have written before of Ryan’s love of hockey statistics, most especially the standings. Our house is littered with notebooks and sheets of paper full of hand-written, impeccably neat and entirely accurate NHL standings. They are accurate in every way imaginable. The total number of wins for the 30 teams equals the total number of losses. The total games played will always be an even number (since each game requires two teams, the number cannot be odd). If he does expanded standings, with more info, the total goals for will equal the total number of goals against. Some standings are exact replicas of a random date for a recent NHL season (written out from memory — he has memorized at least two entire NHL seasons) while others are entirely made up. Sensing a teaching opportunity, I once spent a couple of hours setting up an Excel spreadsheet that would calculate the standings as Ryan entered them on his computer. He had no trouble using Excel, but it was quickly abandoned, I think because he prefers to do the calculations in his head. I suspect that standings appeal to Ryan because they are so precise — because the totals need to match, because they line up in a nice grid, because they are black and white with no interpretation necessary. Another complicating factor are the somewhat arbitrary tie-breakers. The first tie-breaker is fewest games played, the second is most wins (excluding shootout wins). Again, these confuse many hockey fans, but not Ryan. Once I explained them to him, he mastered them and his standings are always correct. You might be wondering where I am going with all this. I do have a motive beyond making all of you better hockey fans. Ryan spends a lot of time playing a couple different NHL games on the Wii. He has gotten good at them and beats me easily when we play. Unfortunately, both of the titles he likes, NHL Slapshot and the NHL 2K series, have been discontinued for Wii, so he tends to grow bored. 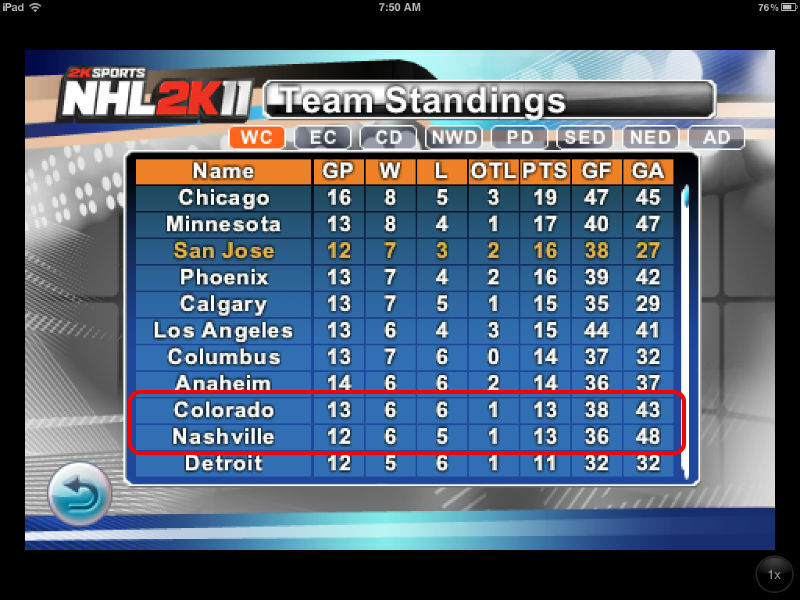 Recently, I suggested he try the iPad version of the NHL 2K game for a little variety. Ryan reluctantly agreed, but once he did he quickly began playing in season mode. A few minutes later, he brought the iPad back to me. It was turned off. I asked him why he had stopped. He explained, annoyed, that the standings were wrong. He gave me all the numbers and told me the teams should be listed in a different order. I slowed him down, and asked him to repeat the information. He was — of course — correct. The game was ignoring the first tie-breaker: fewest games played. Lots of dedicated hockey fans don’t even know that games played is the first tie-breaker, since at the end of the season (the only time breaking ties really matters) all teams will have played the same number of games. The makers for NHL 2K11 are apparently included in this group, because they broke a tie by alphabetical order when the number of games played was different, but the second tie-breaker (wins) was even. This is not the first time Ryan has caught a mistake along these lines. He also recognized an error in a Panini trading card. While I keep thinking that this extraordinary skill might lead to a career some day (more on that later this week), in this case I faced a or more immediate problem. Ryan refused to play the game because of the standings error, leading to the dreaded “I’m bored, but what can I do?” refrain. Here too, I saw a teaching opportunity. I wanted to see if I could dent this inflexibility a bit. I told him that the incorrect tiebreaker wouldn’t matter at the end of the season once all teams had played the same number of games, and asked him why he would let such a little thing keep him from playing a game that he enjoys. To my pleasant surprise, he agreed, and he disappeared again with my iPad. He emerged later to tell me all about how his beloved San Jose Sharks had defeated the Tampa Bay Lightning. I took more satisfaction from his willingness to overlook the error in the game than I did in the remarkable focus and attention to detail that discovered the error in the first place. I’m not sure how I feel about that. After all, it remains an open question as to which will carry him further in life: those remarkable skills, or the ability to step outside of the bounds they impose to fit in better with society. I know which one we spend more time on as his parents — the latter. And while I celebrate his growing social awareness and ability to bend his rigid self to the more malleable world around him, that also makes me a bit sad. I have described witnessing the amazing powers of his mind unleashed as “bittersweet.” What I mean by that is this: While I am internally proud of the things he can do, I am outwardly shy of focusing on them because they can make him seem weird or different. 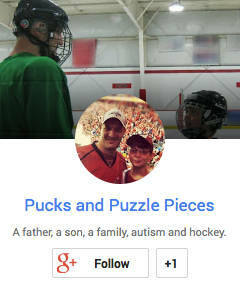 As part of telling Ryan about his autism last year, we emphasized his memory as one of his exceptional strengths and we continue to do so when it comes up. But I don’t go around doing the parental-bragging thing about it, they way I probably would if he were and honor student or a supreme athlete. The reality is my son has displayed a skill that very few people are capable of. Memorizing two entire NHL seasons (that I know of, there could be more) of 1,230 games each is probably akin to memorizing Pi to several hundred digits. He doesn’t just know the final standings. He knows the location, date and final score of each of those 1,230 games, along with each team’s record before and after. Why shouldn’t I celebrate this achievement the way I would a straight-A report card or a bunch of Little League home runs? Maybe I’m the one that needs to learn to step outside of my comfort zone. That really is remarkable. I, on the other hand can’t remember where I parked my car a few hours ago. You and me both! I can, however, tell you who was the MVP of every Super Bowl. Maybe that apple didn’t fall too far from the tree. I would agree..it is bittersweet…and so difficult to find that happy medium at times. good for you. i still struggle with that issue, we’re only human. very good read. thanks for sharing! Oh I struggle with it plenty. I believe that fitting in is important, but as with most things autism-related, there is a struggle as to how much do we push him to conform. I just share how brilliant my nephew is with everyone I know! Trying not to think how he could also out spell me at 8 years old! Continue to celebrate his beautiful mind. The best people in his life now and the future will, too. Thank you. He is brilliant in so many ways. I hope every day that it is going to lead him somewhere positive.